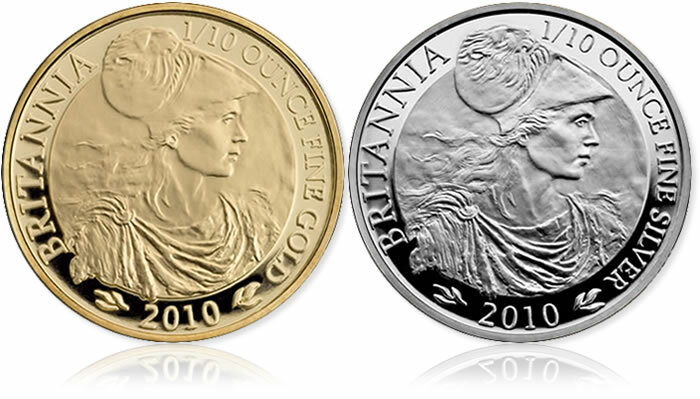 Britannia once again majestically adorns a new collection of gold and silver coins released by the British Royal Mint within its 2010 Britannia Silver and Gold Collections. These coins come in four different sizes including one ounce, one half ounce, one quarter ounce and one tenth ounce — with all of them featuring a new design of Britannia on the reverse as envisioned by artist Suzie Zamit. Zamit’s work marks the ninth new Britannia design to be seen on the silver proof coins since their debut back in 1997. The Gold Proof Britannias launched a decade earlier in 1987. Zamit studied sculpture at the City & Guilds School in London and currently teaches the art-form at the Sculpture Academy in London and at the Hampstead School of Art. She is no stranger to coin design as her work has previously been seen on the 2009 £2 Charles Darwin Coin also issued by the Royal Mint. "Regarding the design brief for Britannia," artist Suzie Zamit states as she explains the process of creating her Britannia design, "…there aren’t any constraints apart from the lettering and the date, etc. "I did about ten designs on paper," Zamit continues, "and I really chose quite a selection going from sort of standing, sitting, three-quarter, close-up, the full gamut. But I was trying to really incorporate all the symbolism to do with which way she’s facing, whether she’s more war-like, more peaceful, you know the olive branch symbolizing peace and food. So there’s lots of different elements I was trying to get in. They ended up actually choosing two to go through to the relief stage. I only had time as a sculptor to sculpt one of them, so I went for the profile head which is obviously my territory." The profile of which Zamit spoke of is exactly what we find on the reverse this year’s Britannia collections. As each of these coins are legal tender in the United Kingdom, Ian Rank-Broadley’s portrait of Queen Elizabeth II is found on the obverse. All of the silver proof coins are struck from .958 Britannia Silver which is a standard dating back to the late 1600’s and contains 95.8% silver and 4.2% copper. Most traditional silver coinage is struck using the sterling alloy which only contains 92.5% silver content. The gold proof Britannias feature 22 carat gold. The silver proof collection contains all four sizes of the coin (one ounce, half ounce, quarter ounce and tenth ounce), as does the gold proof collection. A three coin gold collection may also be purchased which contains the tenth ounce, quarter ounce and half ounce coins, but not the one ounce gold Britannia. The Royal Mint is a department of government and its primary responsibility remains the provision of the United Kingdom coinage. Its reputation, however, extends beyond this and internationally it has a reputation for making some fascinating coins for over 100 countries. The history of the Royal Mint itself stretches back over 1100 years. There is an unbroken link from the scattered workshops of the moneyers of Anglo-Saxon London to a single mint within the Tower of London, from a purpose-built premises at Tower Hill to the huge modern coining plant in South Wales. In April 1975 the Mint was established as a Government Trading Fund, operationally very similar to a government-owned company. What is the mintage of Silver and Gold Britannia Coins? How I can order these coins from British Royal Mint as well as coin dealers? maximum coin mintage of 8,000 and limited edition presentation of just 4,500 available individually. The 2010 UK Britannia Tenth Ounce Silver Proof Coin has a maximum coin mintage of 8,000 and just 2,500 available in its own individual display case, demand is likely to be exceptional.